Welcome to Cars of The Ku, a new weekend segment where I highlight a cool car I've found around where I live. Ku (区) is the Japanese word for "city ward." 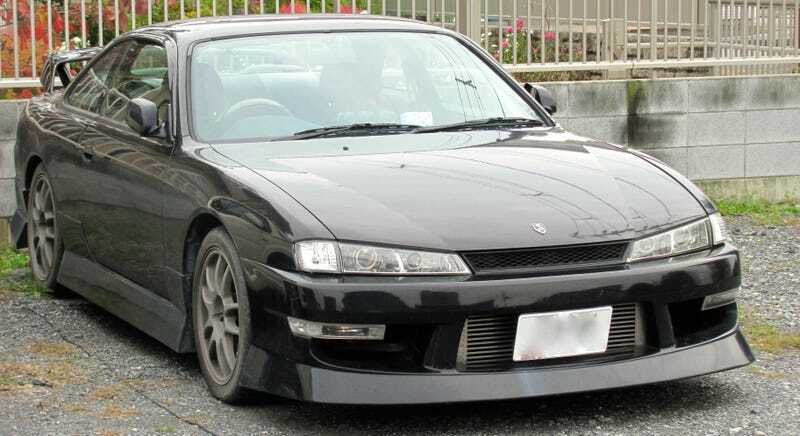 Today's car of the Ku is this Nissan Silvia which looks like it just flew off the set of Star Wars Episode VII. There are several Silvia variations, heavily modified, in the blocks around my apartment. However, this is arguably the cleanest example I have ever seen. I did get a brief chance to look inside, but the vehicle is parked across from a public park. While photographing vehicles in open parking lots is not illegal in Japan, I could tell I was making some of the people in the park nervous, so I didn't get many shots in detail. And there's no telling if the owner lives here, or if she or he is merely a commuter who rode the train into Tokyo, the station just a block over. The use of clear corners and fog lights, the intercooler, and the front lip really gives this Silvia the feeling of Vader's front mask. I know that the "Lord Vader, your X is ready" tagline has been done to death (NOOOOOOOOOOOO!!!!!! ), but honestly, it is very appropriate in this case.